We’ve heard a constant slough of condemnations against the tea parties for being hateful. SEIU members: Are you proud your brethren terrorized a teenager? I’m serious. 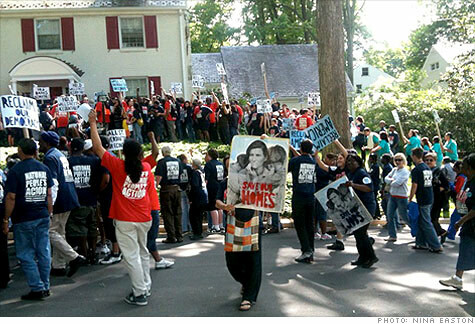 Are you OK with the tactics the SEIU leadership – and 500 members – took when they headed into a residential area to “protest” at the home of Greg Baer, deputy general council for corporate law at Bank of America? They did not just protest. They surrounded the house, got on the porch, used bullhorns and started screaming. Pure intimidation. Unfortunately, the teen son of Baer was home alone at the time. He had to lock himself inside the bathroom and wait for help that would not be provided by the police. The media and talking head liberals have remained quiet about this mob surrounding the home of a bank executive and terrorizing a teenager eight days ago, but they continue to express concern about TEA Party protests around the country and suggest they set a bad tone. Are they friggin’ kidding me? These SEUI members are the mob of our time. That’s right, I said members. Sure, leadership gurus like former SEUI president Andy Stern – who by the way now sits on the president’s Fiscal Responsibility Commission – may be egging the members on, but this intimidation purely falls on the membership who did this. You terrorized a teenage kid in his home. Feel big and powerful? Proud of yourselves? Thugs … all of you. Nina Easton, Washington bureau chief for Fortune, Fox Contributor and neighbor of Baer, recalls the mob scene and provides us with the image. Click to enlarge. Waving signs denouncing bank “greed,” hordes of invaders poured out of 14 school buses, up Baer’s steps, and onto his front porch. As bullhorns rattled with stories of debtor calls and foreclosed homes, Baer’s teenage son Jack — alone in the house — locked himself in the bathroom. “When are they going to leave?” Jack pleaded when I called to check on him. Baer, on his way home from a Little League game, parked his car around the corner, called the police, and made a quick calculation to leave his younger son behind while he tried to rescue his increasingly distressed teen. He made his way through a din of barked demands and insults from the activists who proudly “outed” him, and slipped through his front door. In the 1990s, the Baers’ former bosses, Bill and Hillary Clinton, denounced the “politics of personal destruction.” Today politicians and their voters of all stripes grieve the ugly bitterness that permeates our policy debates. Now, with populist rage providing a useful cover, it appears we’ve crossed into a new era: The politics of personal intimidation. Big Government writes about this story here, here, here and here. Scott Johnson at Power Line Blog also writes. Main stream media outlets? President Obama? Democrat leadership? Crickets. Easton – because she simply took a picture and wrote about what happened – has become a secondary target for the SEIU. Disgusting intimidation. Here’s another story on the same story from Investors. Few other media outlets have bothered to cover it. “The politics of personal intimidation.” When have the tea party protesters done anything like this? How does “never” sound to you liberals? They never done anything like this. They’ve NEVER terrorized a man’s children. That’s something that only Democrats are loathsome enough to do. When Greg Baer’s terrified 14-year old son called him, Greg called the police. Do you know what they told him? They said that they feared the protest would turn into a violent riot if they showed up, so they wouldn’t show up. And Greg Baer was left with the difficult decision of whether to leave his younger son alone in his car so he could go through the screaming mob gantlet to go into his home to save his older son. Our society is breaking down into a fuzzy mess of political correctness. We are making ourselves more and more stupid. We seem to dare not deal with dangerous people – such as terrorists, illegal immigrants, and SEIU thugs terrorizing children – while increasing attention is paid to little old ladies who might get so angry they’ll go to the extremes of calling their congressman. And when the political left and their media representatives demonize the tea parties for their peaceful demonstrations and falsely depict them as “hateful,” we should give them ANY respect whatsoever WHY, exactly? The mainstream media falsely reported a story of tea party protesters spitting on a black politician, when the event never occurred, and of using hateful racial slurs against black politicians when there is absolutely no record of any such thing happening in spite of the instant in question being widely documented. When pro-illegal immigration Latinos used refried beans to paint swastikas on the Arizona capital, the mainstream media largely ignored it. When hundreds of violent pro-illegal immigration protesters attacked a man and then threw rocks and water bottles at retreating police, the mainstream media largely ignored it. When the American political left demonstrated that it was even less tolerant and more violent than Nazis, the mainstream media largely ignored it. When a liberal mob chased down and physically attacked a pair of Republicans, the mainstream media largely ignored it. And when instance after instance of actual violence has occurred perpetrated by the left, the mainstream media has basically ignored it. The next time the left and the leftist media criticize conservatives for their protest style, just realize that they are very full of something that is very brown and very stinky.